First up, make sure all your margarita bases are covered. You can't claim to throw a legendary Cinco de Mayo party without raising the bar, so instead of serving basic margaritas, take things to the next level with frozen ones. They're refreshing, delicious and lots of fun, and bring that beachside-resort feel right to your patio. Nothing puts a damper on a party like a shortage of drinks, though, so turn to the Margaritaville® Tahiti™ Frozen Concoction Maker® to make sure that frozen margarita well never runs dry. The Tahiti™ blends up to 72 ounces of frozen concoctions in three different blending jars using fully automatic operation, so can mix up an exciting selection of frozen margaritas to your guests' delight. This recipe takes the stars of a margarita - the tequila and lime - and puts them in the spotlight to let them shine. 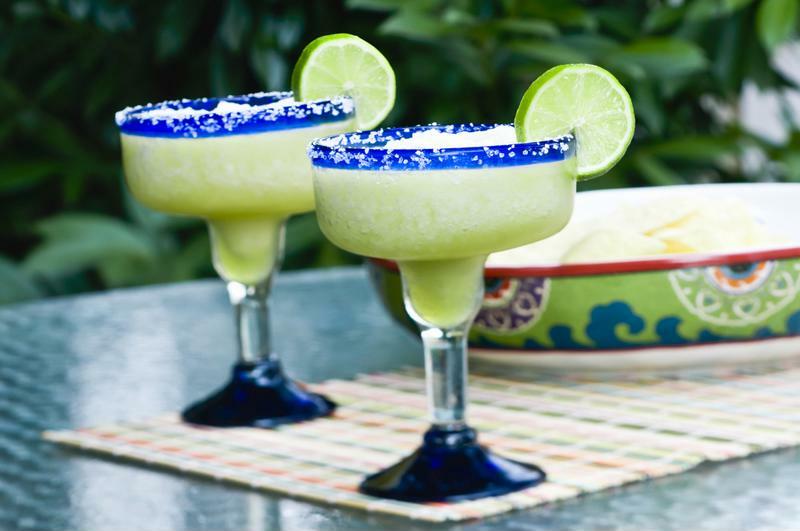 Prepare margarita glasses by dipping rims in lime juice and then in salt or sugar to coat. Set aside. Add ice to the ice reservoir and all remaining ingredients to the Margaritaville® Tahiti™ Frozen Concoction Maker® glass jar. Concoct and pour frozen margarita into prepared glasses. Garnish with lime slices and serve. First things first: Concoct some refreshing frozen margaritas that will wow your party guests. Watermelon, cucumber and cilantro combine to create a refreshing frozen margarita with an intriguing flavor profile. Prepare margarita glasses by dipping rims in lime juice and then in sugar. Set aside. Add ice to the ice reservoir and all remaining ingredients to the Margaritaville® Tahiti™ Frozen Concoction Maker® glass jar. Concoct and pour frozen margarita into prepared glasses. Garnish with watermelon slices and sprigs of cilantro and serve. Keep things fun and carefree with this feisty frozen margarita recipe, which tempers the tropical sweetness of pineapple with spicy chili and the smooth kick of tequila. Prepare the margarita glasses by dipping rims in honey and then in sugar to coat. Set aside. Add ice to the ice reservoir and all remaining ingredients to the Margaritaville® Tahiti™ Frozen Concoction Maker® glass jar. Concoct and pour frozen margarita into prepared glasses. Garnish with pineapple slices and serve. You've got the margaritas down pat - now it's time to create the perfect ambiance for your Cinco de Mayo party. Think high energy, sunny days and good vibes. Make sure you have enough space on your patio to accommodate your guests, and set up your margarita bar in the corner to keep the drinks flowing without a hitch. Lighting will set the mood - and keep the party going after sunset. Choose colorful lanterns and string lights and hang them around the patio railings, across tables and umbrellas and around any nearby trees or bushes. On your patio tables, you can arrange paper-mache decorations, mini sombreros, pineapples and bouquets of bright and colorful flowers. Embrace a playful party attitude for the most fun fiesta vibes. No Cinco de Mayo party is complete without some delicious eats. Set up a taco and nacho bar: Arrange taco fillings like cooked ground beef, chopped lettuce and tomato and shredded cheese in large bowls, with a selection of hard and soft taco shells. Pour tortilla chips in baskets and then set out all the fixings, too, like salsa, guacamole and sour cream. Guests can help themselves and make all their Cinco de Mayo food dreams come true! Your party is the perfect time to also fire up the grill and get cooking. Shrimp or pork skewers drizzled with lime juice and sprinkled with salt and cilantro are the perfect accompaniments to frozen margaritas, while grilled pineapple has a tasty smoky-sweet flavor guests will love. Be creative with the way you serve your snacks, too - dip or salsa can go in a hollowed-out pineapple, and candy or other sweets can be corralled in margarita glasses. Now, you've got everything you need to throw an awesome and unforgettable Cinco de Mayo party. So turn on some music, start pouring those frozen margaritas and enjoy the fiesta!